Learn how to control the ESP8266-based SONOFF device using Ubidots. In this guide you will learn how to control any 110-240V appliance for $5, using Itead's SONOFF device. Compared with the $30 WiFi smart plugs out there, the SONOFF is a great alternative for making smart home and even industrial IoT projects at a larger scale. Moreover, it is based on the popular ESP8266 Wi-Fi chip, making it compatible with the Arduino environment and other resources like our ESP libraries at Ubidots. The SONOFF comes with its own firmware and mobile app, but we think that its main value actually lies in its form-factor and low price. This is why we decided to do some hacking and unleash its full power! The SONOFF contains a relay, an ESP8266 WiFi chip and the required circuitry to power it with the AC line of a power outlet. It also comes in a nice package that makes it look more professional than an average DIY project at home. Disassemble the SONOFF device, this is to access the SONOFF TTL pinout, which we'll need to program the onboard ESP8266. You will need to solder four pins, these are shown in the picture below. into the Additional Boards Manager URLs field. This field supports multiple URLs, separating them with commas, in case you already have other URLs typed. 4. Open the Boards Manager from Tools -> Board menu and install ESP8266 platform. Select your ESP8266 board from Tools > Board menu after installation. 5. Download the UbidotsESPMQTT library here. 6. Now, click on Sketch -> Include Library -> Add .ZIP Library. 7. Select the .ZIP file of UbidotsESPMQTT and then click on “Accept” or “Choose”. 8. Close the Arduino IDE and open it again. 1. Login in your Ubidots account. 2. Go to Sources and click on the orange plus symbol. 1. Go to Dashboard and click on the orange plus icon. 2. Click on Control -> Switch and select the Data source and Variable to control created before. Here is the code that turns on/off the SONOFF device. To use this code don't forget to change the TOKEN with your Ubidots' account token. Change WIFISSID and PASSWORD with your network credentials. 1. 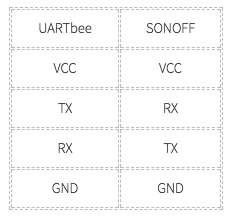 Connect the UARTbee to your PC's USB. 2. Press SONOFF's button and disconnect the USB at the same time. 3. While still pushing the button, connect again the USB. 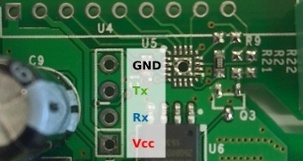 These steps are meant to bring the SONOFF into programming mode. 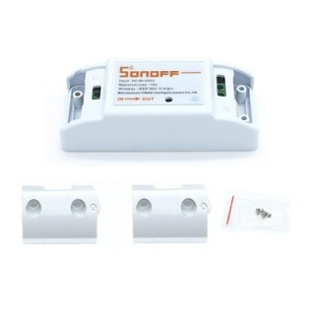 Now it's time to make things "smart" by adding your SONOFF to them; control your lights, open or close your garage, etc. Ubidots is a cloud service empowering thousands of engineers around the world to build IoT projects, both in education and the enterprise. To learn how Ubidots can help your business check out our features or leave us a message. Originally Published in Ubidots Blog May 20, 2016.